House Speaker Paul Ryan and Vice President-elect Mike Pence plan to include defunding of Planned Parenthood in a budget reconciliation bill intended to also defund the Affordable Care Act. But just as Republicans are discovering that undoing the health law could be complicated, so too is separating the controversial reproductive health care provider from its federal funding. Efforts to hastily jettison Planned Parenthood from federal ledgers could actually jeopardize GOP efforts to repeal the health law. One problem is that Planned Parenthood gets its funding from several different government sources. According to the group's most recent annual report, Planned Parenthood affiliates got $553.7 million from federal, state, and local governments, accounting for almost half of its total funding. None of the funds from either program may be used for abortion, under longstanding federal prohibitions. Only half of the Planned Parenthood affiliates even offer abortion services, the group says. But it is still the largest single provider of the procedure in the nation, and that has made it a target for anti-abortion lawmakers since the 1980s. In recent years, one of the most ardent foes of the organization has been Vice President-elect Mike Pence. When he was a member of the House of Representatives, he led unsuccessful efforts to defund the program. As governor of Indiana, he was able to accomplish some of his goals. He also vowed to stop federal spending for Planned Parenthood during the campaign last fall. One big reason is that taking away Planned Parenthood's access to Medicaid funding would require a change in the federal law that guarantees most Medicaid patients with a choice to use any qualified provider. The Department of Health and Human Services has repeatedly warned states that have tried to evict Planned Parenthood from their Medicaid programs that they cannot legally do that because such a move would violate that law. And federal courts have consistently blocked states that have tried to end Planned Parenthood's Medicaid funding. Changing that section of Medicaid law likely would require 60 votes in the Senate to break a filibuster by Democrats. Republicans currently have 52 votes. However, the budget reconciliation bill that is expected to be used to repeal portions of the health law operates under special rules. It cannot be filibustered and needs only 51 votes to pass. That presents two problems for Republicans. According to a 2015 Congressional Budget Office analysis, permanently changing the Medicaid law to make Planned Parenthood ineligible would cost more, not less — approximately $130 million over 10 years. That is because, said the Congressional Budget Office, taking away contraceptive access for some women would result in more pregnancies, and "additional births that would result from enacting such a bill would add to federal spending for Medicaid." That is not just theoretical. In 2013, Texas kicked Planned Parenthood out of its family planning program and gave up its federal funding. The result was fewer women using birth control and more babies being born, according to an analysis published last March in The New England Journal of Medicine. The second problem is political. While the House under GOP control has been strongly in favor of cutting off Planned Parenthood's access to federal funds, there are a handful of Republican senators who oppose the idea. And a handful — three, to be exact — is all it would take to threaten passage of the health law repeal effort. "Obviously I'm not happy that the speaker has decided to include the defunding of Planned Parenthood — an extremely controversial issue — in the (budget reconciliation) package," Sen. Susan Collins, R-Maine, told reporters earlier this month. A spokeswoman for Sen. Lisa Murkowski, R-Alaska, said "she is concerned about defunding Planned Parenthood, as she is a longtime supporter of Planned Parenthood and has opposed broadly defunding the organization." Collins and Murkowski fought against the inclusion of a one-year defunding of the organization in a 2015 health law repeal bill that President Obama vetoed last January. Meanwhile, eliminating Planned Parenthood's access to funding under Title X also would likely be addressed in an appropriations spending bill. The current spending bill for the Department of Health and Human Services (and most of the rest of the government) expires April 28. But rather than simply making Planned Parenthood ineligible, Republicans in the House have proposed doing away with funding for the entire 45-year-old Title X federal family planning program. Instead, they would send the money to the nation's network of community health centers. Last September, the Trump-Pence campaign released a letter to anti-abortion leaders vowing to defund Planned Parenthood "as long as they continue to perform abortions, and reallocating their funding to community health centers that provide comprehensive health care for women." At a CNN town hall Thursday night, Ryan expanded on that. "We don't want to effectively commit taxpayer money to an organization providing abortions. But we want to make sure that people get their coverage. That's why there's no conflict by making sure these dollars go to federal community health centers." "For health centers, which currently serve about 25 million total patients, to have to absorb an additional 2 million people is totally impossible," says Sara Rosenbaum, a health policy and law professor at George Washington University who looked at the issue in 2015. In some areas of the country, Planned Parenthood and community health centers may not overlap. Planned Parenthood says that in a fifth of the counties it serves, it is the only provider for low-income women. Asking community health centers to move into new areas, says Rosenbaum, "displays a fundamental misunderstanding of how long it takes a new provider to move into a potentially new community." Despite the difficulties, the shifts in political control this year leaves Planned Parenthood concerned about its future. 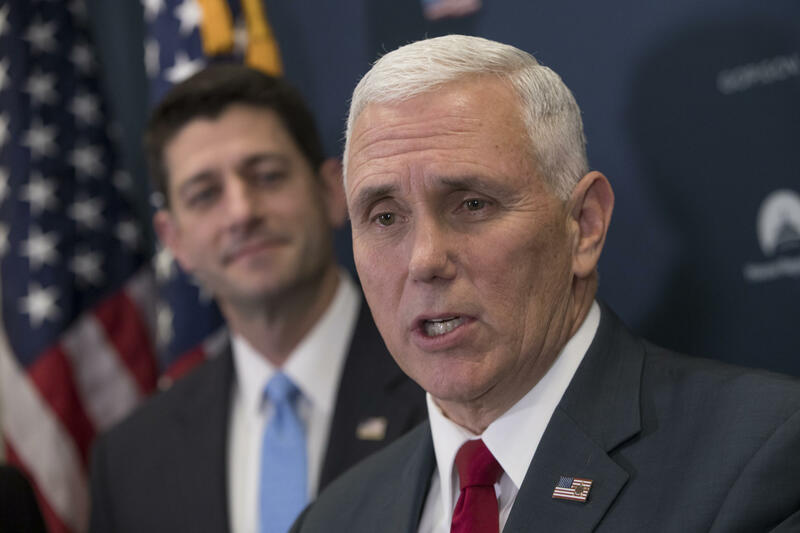 While the organization has weathered funding threats before, "it is very true when you have people like Mike Pence and Paul Ryan who have been laser focused for years [on ending funding], that they will make it a very high priority," says Mary Alice Carter, Planned Parenthood's vice president for communications. She says the organization is counting on the 2.5 million patients it serves every year to make sure their elected officials know they oppose the defunding effort. Whether that will be enough remains unclear.